What is Canary Yellow Fluorite? With an upbeat citrus palette, exuberant canary yellow fluorite reveals an array of happy colors fitting for both spring and fall fashion. Also known as golden fluorite, the bright yellow color of this vivacious gemstone exudes a joyful aura, bringing positive energy, good fortune and happiness to the wearer. Formerly called fluorspar by early miners, the modern name fluorite comes from the Latin "fluo" meaning to flow. It is one of the most popular stones for mineral collectors, perhaps only second to quartz. A member of the halide family, fluorite is an attractive stone with a wide range of colors. It has the unique distinction of being called the most colorful mineral in the world. Is canary yellow fluorite valuable? The value of colored stones is typically determined by a combination of its color, clarity, cut, and carat weight. This is no different when determining what canary yellow fluorite is worth. These guidelines will help you choose yellow fluorite stones for your collection. Color is the most important quality factor for canary yellow fluorite. The most desirable color should be from light yellow to rich golden or deep honey color. Named for the yellow canary, golden fluorite is highly admired for its astonishing beauty. Gemstones with vivid and brilliant golden yellow color are considered the rarest, and command a higher price in today’s market. In contrast, yellow fluorite crystals with significant black and brown traces are considered relatively less valuable. 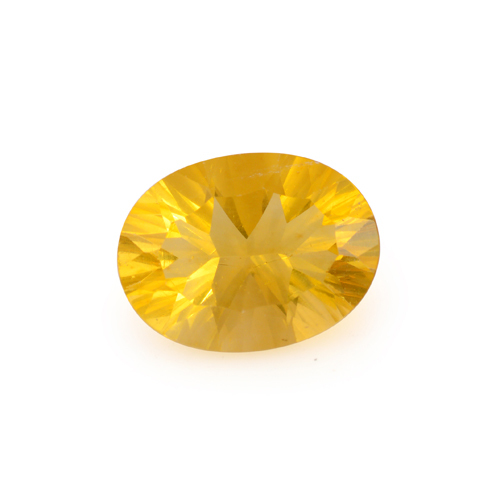 As a Type II gemstone, expect inclusions in canary yellow fluorite as gems may possess visible inclusions. These do not affect the value of the stone and are evidence of natural origin. Fluorite glows when heated or under ultraviolet light and the phenomenon is called fluorescence. Due to their saturation and deep color, most of these gemstones can appear eye clean when viewed without magnification. Finding an absolutely clean yellow fluorite stone with brilliant-golden yellow hue and good transparency is hard to find and is relatively more valuable, commanding a very high price. High-quality yellow fluorite specimens make attractive faceted stones. 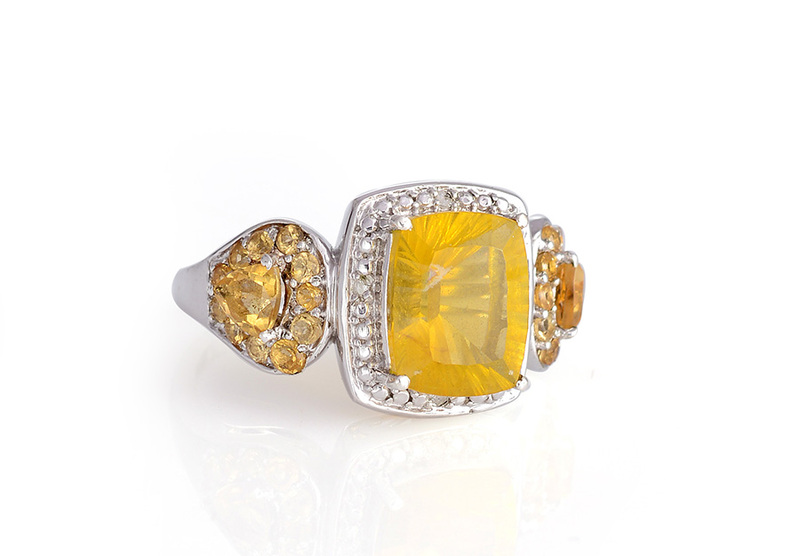 Yellow fluorite is a soft and fragile gemstone by nature, therefore it is rarely found in custom cuts. It is comfortably available in round, oval and polished cabochon shapes. Highly included, lower quality pieces are often used for making beads and crystal spheres. The common sizes of fluorite found at Shop LC are up to 14 mm in round shapes nad 18mm x 13mm in ovals. sometimes they can be as big as 20mm x 15mm. Larger yellow fluorite gems are rare to find and command high prices. Canary yellow fluorite undergoes heat treatment and irradiation to improve the color of the stone. These treatments offer good stability with proper care. Canary yellow fluorite ranks four on the Mohs scale of hardness, making it a fragile gemstone. With low toughness and perfect cleavage, it has limited use in mainstream gemstone jewelry and is not considered a durable option for daily wear. Fluorite has a tendency to chip and owing to its softness, gemstones must be handled very carefully. Proper care and precautions are required while cleaning these yellow gems. Simply wash your canary yellow fluorite using a soft brush and warm, soapy water. Scrub until the stone looks clean and rinse with cool water. Dry with a soft, lint-free cloth. Avoid harsh household chemicals and prolonged exposure to extreme heat with these soft gemstones as they can cause the stone to fade or damage its surface. Ultrasonic and steam cleaners are not recommended for this gem. Always store these gems inside a fabric-lined jewelry box or wrapped in a soft cloth. They should be stored separately from other jewels in your collection to avoid accidental damage. Who Can Wear Canary Yellow Fluorite? Despite being a softer gem, yellow fluorite is still quite suitable for protected jewelry such as pendants, brooches or earrings. 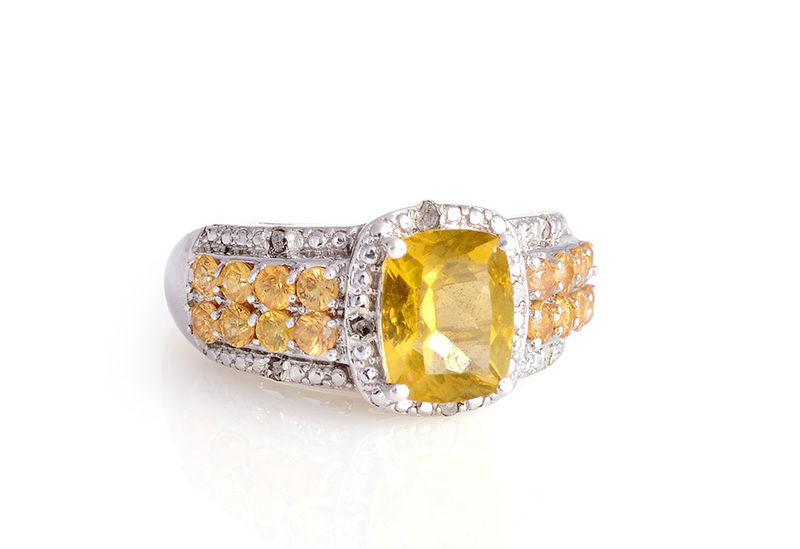 The warm golden yellow of fluorite reminds of the sunny disposition that is fun to wear and complements any outfit. 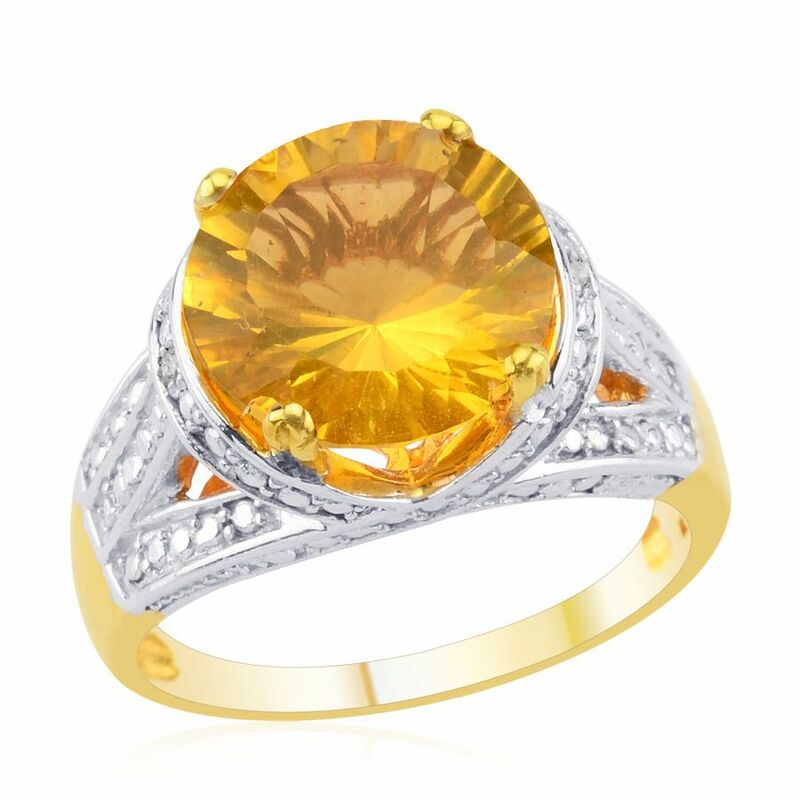 How Does Canary Yellow Fluorite Compare to Other Yellow Stones? When you compare canary yellow fluorite to other yellow stones, the main difference you’ll see is the effect. Canary yellow fluorite exhibits optical phenomena “fluorescence “that is enough to identify and distinguish it from other yellow stones such as citrine, yellow diamond, and yellow sapphire. Also, yellow fluorite is much softer when compared to other yellow stones, making it more popular with collectors than jewelers. For those mesmerized by the beauty of a yellow diamond, yellow sapphire, yellow spinel, yellow jade or yellow opal, consider canary yellow fluorite. Where Does Canary Yellow Fluorite Come From? Canary yellow fluorite occurs in many places in the world, including Argentina, Austria, Canada, China, England, France, Germany, Mexico, Morocco, Myanmar, Namibia, Russia, Spain, Switzerland, and the United States. However, Shop LC sources the best quality of canary yellow fluorite from China. How is Canary Yellow Fluorite Mined? Fluorite is usually deposited in veins by hydrothermal processes, in sedimentary deposits around hot springs. In these rocks, it often occurs as a gangue mineral associated with metallic ores. They’re also found in the fractures and cavities of some limestones and dolomites. Fluorite rich veins may be weathered to depths of as much as 75 meters. In this case, fluorite is mined in open pits with draglines, scrapers, or power shovels to depths of as much as 50 meters. Beneath that, underground mining methods, involving modified top slicing or overhead shrinkage stopping, are used. What Does Canary Yellow Fluorite Mean? Canary yellow fluorite is believed to generate peace while boosting ingenuity and poise in the wearer. Its cheerful palette assists with mental quickness, deeper focus and sound decision making. Yellow fluorite is considered less calming but more energizing than other fluorites. Known as the ‘Genius Stone’ and ‘The Stone of Discernment,’ fluorite is thought to attract and defuse negative vibes. It is sensitive and responsive to the vibrations of other gemstones and can boost intuition. Yellow fluorite enables the wearer to overcome self-defeat and reduces jealous tendencies that stem from insecurity. Gem therapists attribute yellow fluorite with many healing properties. They believe yellow fluorite is a wonderful stone to heal excessive energy and relieve nervousness. It is believed to be highly beneficial to dissipate symptoms of colds and flu, sinusitis, bronchitis, dry cough, pneumonia, and nerve-related pain. It is also said to combat disorders such as anorexia, stomach problems, joints, and liver problems. It’s also prized for its detoxification effects. It’s best to wear yellow fluorite pendant so that the crystal’s energies can make a good connection with your chakras. Carry yellow fluorite gem in your purse or wear it as a pendant when you have a sore throat or a bad cough because it can ease the discomfort and facilitate a quicker recovery. Hold a fluorite crystal in your hand as you meditate or relax and you’ll instantly feel the calmness and peace enveloping you. Is Canary Yellow Fluorite a Birthstone? Canary yellow fluorite is not recognized as an official modern birthstone but can make a great substitute for the November birthstone, citrine. Canary yellow fluorite ranks four on the Mohs scale of hardness. This variety of fluorite is known for its light to golden yellow color. Shop LC sources our supply of canary yellow fluorite from China. Canary yellow fluorite undergoes heat treatment and irradiation to improve color. Canary yellow fluorite may also be referred to as golden fluorite.